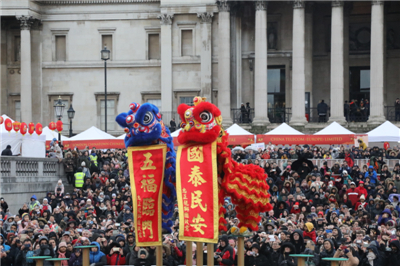 On February 10, the sixth day of the first month of the Chinese lunar year of the Pig, the Chinese New Year Celebration hosted by the London China Town Chinese Association (LCTCA) and sponsored by the Greater London Authority and the Westminster City Council was being held at Trafalgar Square in central London. Despite of the fine drizzles, the Square was packed with people and bathed in a festive atmosphere, with gongs and drums beating, flag fluttering and dragons and lions dancing. Ambassador Liu Xiaoming and Madame Hu Pinghua, the Rt Hon. Mark Field MP, FCO Minister of State for Asia and the Pacific, Sadiq Khan, Mayor of London, Lindsey Hall, Lord Mayor of Westminster, Chu Ting Tang, President of LCTCA and Li Guohong, Head of Festival of Spring Ensemble of Overseas Chinese Affairs Office of the State Council and All-China Federation of Returned Overseas Chinese (OCAO) attended and addressed the opening ceremony respectively. The Rt Hon. Lord Bates PC, Minister of State at the Department for International Development (DFID), Councillor Nickie Aiken, Leader of Westminster City Council, and representatives of overseas Chinese, students and Chinese institutions joined hundreds of thousands of people from all walks of life in the UK and visitors from different countries to watch the celebration and parade in and around the square. Her Majesty Queen Elizabeth II and Prime Minister May both sent their messages of congratulations to the celebration. The Queen sent her good wishes to all those at the event for a most enjoyable and successful event. Ambassador Liu extended his greeting of the Year of the Pig to everyone, his warmest welcome to the artists from Festival of Spring Ensemble of OCAO and Happy Spring Festival Ensemble of Ministry of Culture and Tourism of China, who travelled all the way to London, and his sincere thanks to the Greater London Authority, the Westminster City Council, and LCTCA. He noted that across the UK, Chinese New Year is celebrated in every corner of the land and become popular among British families. 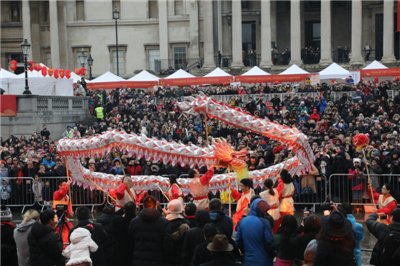 In recent years, this annual extravaganza has been drawing an ever larger crowd, making Trafalgar Square the largest Chinese New Year celebration outside Asia. Over the past nine years, the Chinese New Year celebrations have set the stage for the East to meet the West and made it possible for different cultures to learn from each other and thrive together. They are building bridges of mutual understanding and mutual learning. “The best example is Peppa Pig. This British cartoon character has gained such popularity in China that it has become the ‘mascot’ of the Year of the Pig. 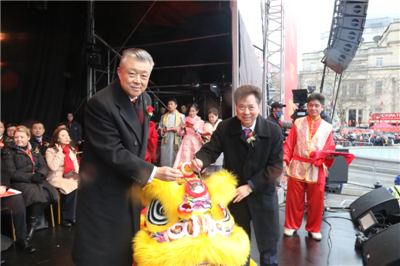 Over the past nine years, the Chinese New Year has borne witness to ever deeper friendship between China and the UK. In recent years, as the China-UK ‘Golden Era’ continued to develop, bilateral exchanges and cooperation in the fields of culture, education and tourism have gone deeper. More and more Chinese tourists coming to the UK during the Chinese New Year holiday season promises not only jobs and business but also opportunities for better mutual understanding and stronger friendship. ” said Ambassador Liu. Minister Field said in his speech that China and the UK have been working closely in the fields of economy and trade, anti-money laundering, and combating human trafficking, and playing a leading role in tackling climate change. It is vital for China and the UK to strengthen people-to-people and cultural exchanges, which will provide strong support to the continued development of China-UK “Golden Era”. China has become the largest source of international students in the UK. He urged the audience to visit China more often and see this colorful and vibrant country. 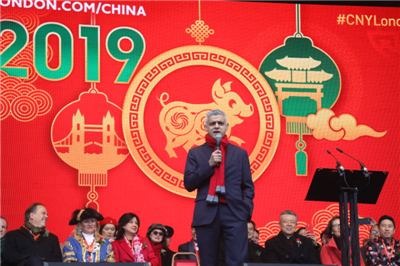 In his speech, London Mayor Sadiq Khan wished everyone “Gong Xi Fa Cai” and “Xin Nian Kuai Le”. 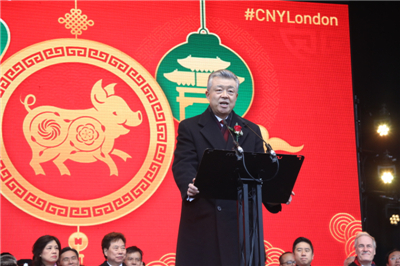 Hailing the Chinese New Year Celebration in London as a good example of China-UK cultural exchanges, he stressed that the overseas Chinese in the UK have made extraordinary contribution, economically, socially and culturally, to building London into one of the greatest cities in the world. Attaching great importance to cooperation with China, London has set up offices in Beijing, Shanghai and Shenzhen and will stay open to Chinese companies, students and tourists. After the speeches, the guests of the opening ceremony joined Ambassador Liu in dotting the eyes of the lion. And then, the thrilling lion dance and powerful and fluid dragon dance unveiled the performance. 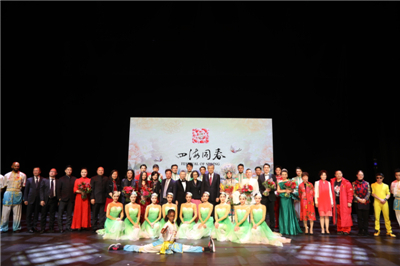 Together with the local cast, the artists from the Festival of Spring Ensemble and the Happy Spring Festival Ensemble presented the audience with a gala of songs, dances, music, folk music, traditional opera, western music and Chinese Kung Fu. The fabulous 5-hour performance, combining Chinese and Western styles, stunned the audience and turned Trafalgar Square into a sea of thunderous applause. Finally, the celebration ended in a beautiful fireworks show. 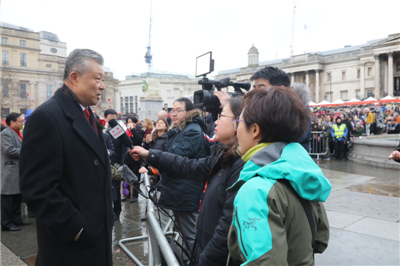 During the celebration, Ambassador Liu gave interviews to Xinhua News Agency, CCTV, China Daily, and Nouvelles D’Europe UK Edition respectively. 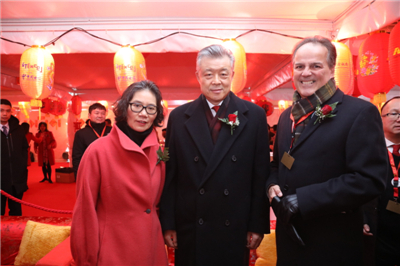 On the evening of February 11, Ambassador Liu and Madam Hu watched the special performance presented by the Festival of Spring Ensemble at London Palladium with over 2,000 overseas Chinese and British friends. They met with all the cast after the performance. This is the eleventh time that the Festival of Spring Ensemble came to London to perform for overseas Chinese.